This is one of those strange stories which you'll believe also being part of some kind of mission-work. It is not. It is just a true story which crowns the other previously told one about the amazing, strange coincidences convincing us to believe. That one describes the facts showing me over the years, step by step, that there is something above us which we cannot really explain or perceive but is however at work, directing the important, crucial moments of our lives. This one is about the event which showed us that Church rituals do help, thus making us become active as believers. Maria and I were sitting on the rug in the living room and were talking, when we suddenly heard a big noise coming from the entrance door, 10 meters in front of us. It was also the place where the two corridors in our flat met: the one leading from the living room we were in - to the entrance, and the other leading also from entrance to the kids room. The noise sounded like a crack. Still, nothing broke. It was a big crack framed by a few smaller ones before and after. Shortly therupon my son appeared near the entrance door, coming from the kids room where some hours ago he and his twin sister were sent to sleep. He had walked the almost 10 meters in some kind of half-sleep. I have immediately realized he was again in “that state”. I called him or went to fetch him, I don’t remember. Then, with him in my lap, on the floor near Maria, I told her why I was so scared about the matter. It was always the same: he was waking up from sleep in the middle of the night, sitting down in his bed, scared in the dark, not awake but also not sleeping either. The whole thing had started about one year or more ago, and occurred once every two months. Then every month. Then once every week. Sometimes he was weeping and thus we could hear him, sometimes we were still awake and heard him anyway. Coming over to him, he was answering our questions but only as a timing, not as a content. I mean, his answer did make some sense, but not related to our questions. He was saying something about Lego pieces, for example. His eyes were usually open and moving as if he was following something invisible to us flying in the dark, just below the ceiling. He was obviously afraid of (the same?) something, and almost always was seeking refuge in our arms. 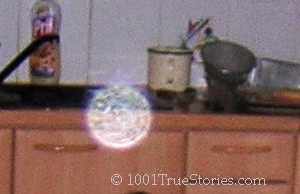 Some whatever-you-call-them, strange flying objects, invisible while taking the pictures, becoming visible on photos made with flashlight. About the WHY they are no bokeh, film flaw, refraction, reflection or so, in this article. Before that summer he had been very difficult to soothe. But then, while visiting our families and friends back in Romania, we had complained about it to the right person, an aunt of me. She advised us, When it happens again, we should caress the top of his head saying a prayer. We knew none, not even the basic one, the Lord's Prayer. Still, in despair, we used it – and found out that it worked: Before the end of the prayer he was mostly quiet and always enough at peace again to go back to sleep. All we knew was that we were reluctant to seek professional help. We didn’t trust doctors because they are working in a system, nay industry, which thrives on people being – or staying… – ill.
We were both educated people, besides my mom had studied Psychology and I myself was very much interested (and autodidact) in it. We thus both knew to tell what real psychological problems looked like. Our son was just a normal developing kid: “round”, no extremes in his behavior. Any doctor would first ask whether we or the boy were experiencing problems of any sort. Which we didn’t. Besides the usual, daily hick-ups of life, all the life circumstances were by the “normal” mark. The best a doctor could do was to prescribe some medicine. Which we don’t trust, not in the least. As the Romanian proverb goes, they “give with one hand and take with two". Anyhow they would have merely removes the symptoms, leaving untouched their origin. Besides, any kind of therapy, and the very fact we would have been starting to go to the doctor, could make our son think he does have some problem in the first place. We didn’t want that either. He also wasn’t get used to. Let aside some minor (plus the “mandatory”) child illnesses, both our twins had barely needed one. What we wanted was to actually get rid of the whole thing. We wanted to know what happens, so that we could act upon the root of the problem, and don’t need anymore those soothing prayers. My first thought was A priest?!?!?! Exactly like this, with many exclamation marks in the queue. It was also my second thought, but more detailed: What the heck could a priest help in this?!?!?! Obviously I had thought it loudly, because Maria said, "Of course he does!! 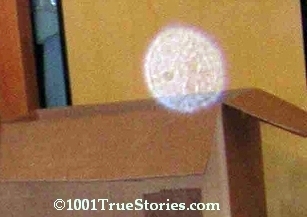 There are unseen entities which small kids do perceive or see. They haven’t yet learned from us these don’t exist." It wold make some sense, if we trusted the words in some popular prayer, "God made both seen and unseen things". He should have also the power upon them. But what if you don't really trust them yet? As you can read here, simple Physics tells us that light and any other electromagnetic waves like radio, TV, cell-phone, X-rays or cosmic radiation differ from each other merely through their wavelengths. Who knows if / how the latter ones are organized, invisibly for our eyes. Years after having had classified this story here, I heard other strange stories. One from my dear sister-in-law with a kindergarten girl who has been very sad for some days. And from a friend of mine – the little girl who entered the room where her father was exercising yoga. So I just looked at my friend and kept my mouth shut. Actually not because I didn't believe, but because I didn't know what to say. By that time we were not anymore atheists. All those previous coincidences with St. Dumitru’ day October 26th had already occurred and we knew that, somehow, he did help. We were however not active believers. We saw no need in going to Church, regularly praying, observing fasting and all kind of rituals or other “faith accessories”. It was enough for us that we had made the leap to believe in God. We even had a small altar home, with different Christian objects mixed with some Buddhist others. It was the same, we thought, since they all respect the same God, seen from different, cultural conditioned, points of view. And that was it. It is by then when we also learned that our altar was an energetic cacophony. Why? Well... The energy of each religion system has its own frequency. Mixing them on the same place is like an orchestra with instruments playing wild. We didn’t even know where in Vienna the Romanian Orthodox Chapel was. My husband felt ashamed to go to speak with the priest only now, when he obviously had an interest. Maria offered thus to go with him and do the talking. The next day they found the priest. He was moved by our uncanny story and deeply apologized not being able to come in that very evening. He had different events in Vienna and in a village further away where he was bound to appear. But he did come the next day and did it. We’ve learned then that the Orthodox priests make that once a year, going to each house in their parish between Christmas and the January 6th's Epiphany. I remember thinking that, if it has to be once a year, then until our next time it would take longer than exactly one year. So I hoped that the ritual now would “hold” also over the “gap“. It did. Next time when our son woke up again in the middle of the night was about 11 months later. But that awakenings had almost no resemblance with those which had tortured us so much, it was something that could happen to anybody, anytime. And then it was really over. Would YOU miss in this situation, having an evidence of their power, any year's ritual house cleansing! ?